Posted December 4th, 2013 by tom44 & filed under Prepare For Disaster. NAIROBI, Kenya – Should disaster strike in East Africa, a growing partnership between U.S. Army Africa and Kenya’s military designed to improve medical preparedness could help avert crisis. Lt. Col. John Casey, U.S. Army Africa’s deputy surgeon, recently held a familiarization event with Kenyan military medical officers to discuss techniques to plan for medical response to disasters. During the four-day seminar, Casey, 41, of Florence, S.D., discussed the U.S. Army’s planning process for unforeseen disasters and how U.S. military medical staff undergo training to respond. They discussed medical response to public health issues and looked at psychological aspects during disasters. They also examined the various stages of disasters, how to triage sick and injured people, plus the psychosocial needs of patients. Kenya’s military has an established medical corps that maintains a significant capacity to support routine medical operations, said U.S. Navy Lt. Brett Hicks. “Much of our talks focused on what is appropriate for medical personnel to do when working in a stressful environment, where the military is working civilian agencies to mitigate human suffering during both natural and man-made disasters,” said Hicks, 35, of Atlanta, Ga., a patient administration officer at the U.S. Naval Hospital in Pensacola, Fla., who last worked with Casey in 2007 on a medical mission in the Philippines. Hicks’s lecture focused on public health issues during disasters, everything from environmental hazards to diseases people face when displaced from their homes. U.S. Army Africa, the Army service component for U.S. Africa Command, regularly deploys teams of mentors to countries in Africa to develop cooperative relationships with land forces in Africa. These teams focus on niche capabilities, such as military medicine, logistics, maintenance and security operations. U.S. Army Africa’s goal is to work with the land forces of partner nations in Africa to strengthen their capacity and increase overall security, stability and peace on the continent. In the future, the U.S. military may work with African medical officers to focus closer on developing medical plans, to include organizing logistics required to support medical efforts during disasters, Hicks said. While in Nairobi, Casey and Hicks also met with senior leaders at the U.S. Army Medical Research Unit – Kenya, Walter Reed Army Institute of Research unit with four decades of experience battling disease in East Africa. “USAMRU-K offers several training and partnership opportunities that may be of interest to Kenyan military medical officers, especially in malaria diagnostics,” Casey said. 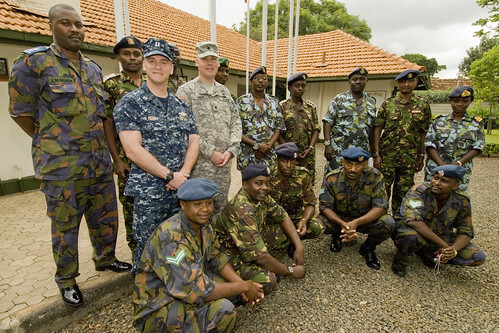 On the final day, Casey and Hicks joined their Kenyan counterparts during a visit the Regional Disaster Management Center of Excellence, where director Shem Amadi, a retired Kenyan air force colonel, shared information about ongoing preparedness training and discussed the response to Kenya’s 2007 post- election violence. 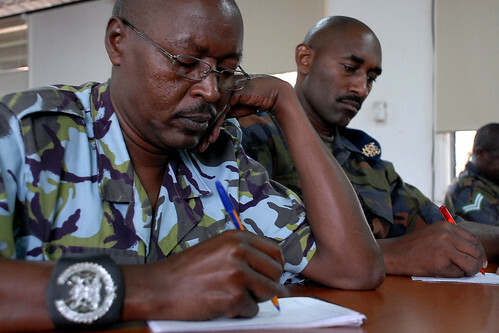 The idea of a regional center came from the U.S. military and U.S. Embassy in Nairobi, Amadi said. On Aug. 15, 2005, U.S. Army Gen. John Abizaid, then-commander of U.S. Army Central Command, was on hand at the center’s opening. The tree he planted as part of the dedication is now more than 15 feet tall. “This center is a symbol of friendship between us and the American people,” Amadi said. “We have an enduring partnership. 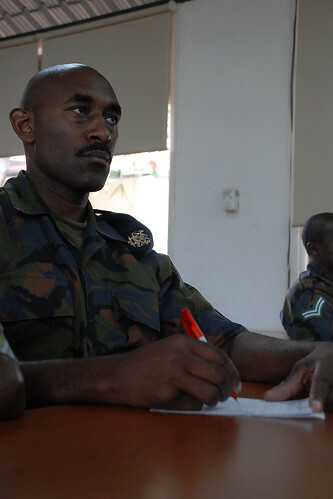 In September 2009, military and civilian emergency response planners from Burundi, Rwanda, Tanzania, Uganda and Kenya trained at the center on pandemic influenza intervention. Afterward, they took part in Natural Fire 10, a humanitarian and civil assistance exercise co-led by U.S. Army Africa and the Ugandan People’s Defense Force. “This was the first example of disaster response planning at a regional level, which was then tested during Natural Fire in Kampala, Uganda. It was a great event to evaluate planning.